Every day you get up from your bed you, say a hello to your family and preparing yourself for the day you have to face. Every person has different habits and rituals can help him/her to manage his/her day with success. Is not always easy to keep on follow certain habits, every day, day in and day out. But in the long run is rewarding. This small book will teach you how to achieve your goals via personal growth and good habits that may change the way you live and do things. Habits and rituals are power levels can change the way you impact your surroundings and bring results. Either at a professional or a business lever. Small changes in everyday level can bring exponential results in the long run. Trust me! I am a person who wants tangible results, as you are! I want to focus on the things matter the most for me and my family and I want to achieve my personal and business goals (as you). That’s why for very long now I have study, test and benchmarking many of the productivity and effectiveness tricks, the methods, and the approaches can give me an edge in my daily activities and in my long-run goals. No, I am not a productivity guru of the short, or someone has all the answers. I am an ordinary person as you trying to maximize his efforts and his resources to achieve his objectives. That’s why I have developed this small e-Book. This free productivity eBook is a record of my findings in the area of productivity and can serve as a reference for people want to do more in their lives with their available resources! This ebook explores the connections of small changes to the final output and what role plays in that process your goals, your beliefs, and your habits. What are you going to learn by reading this small productivity book? With this book you can get some more ideas, approaches, and tools, to achieve your goals. 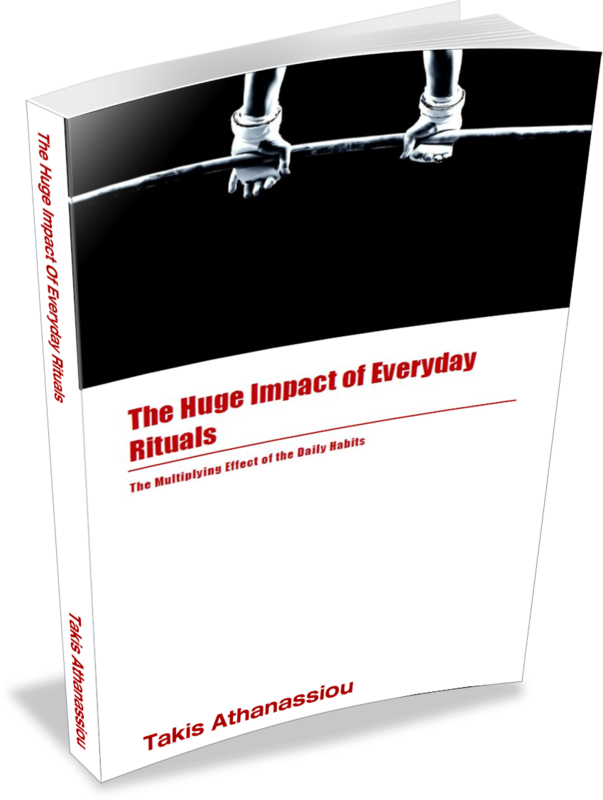 You can get your free copy of the “The Huge Impact of Everyday Rituals: The Multiplying Effect of the Daily Habit” by fill in your name and your e-mail to the form below!